One of Philadelphia's most famous symbols, Boathouse Row at night, from the perspective of the Schuylkill Expressway, Interstate 76. To fully appreciate its majesty, just click directly on the photo to enlarge it. This is an outstanding picture of Boathouse Row, by day. Best of all, you can identify each Boathouse. To do so, click directly on the photo, which will take you to the full size version on Flickr. Once you're on that page, just roll your browser, directly on each one - you'll see a box, and its name will pop up, next to the box. 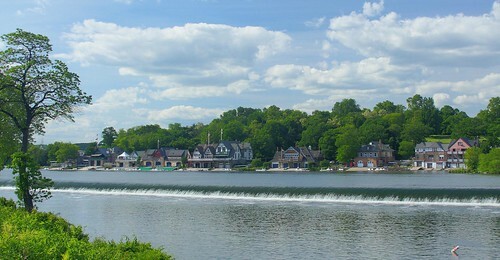 By day, Boathouse Row, located on the Schuylkill River, is one of the most popular recreational areas in Philadelphia. By night, its gorgeous illumination, visible for travelers on Interstate 76 - the Schuylkill Expressway - make it one of the most famous scenes of Philadelphia. In addition to its visual beauty, Boathouse Row also has a surprisingly rich history. Its formal name is the "Boat Clubs of the Schuylkill Navy", but "Boathouse Row" is the universal phrase, used to describe it. Schuylkill is pronounced, phonetically, "Skoo - kull". Its name derives from the Dutch word for "hidden river", and was given a Dutch name by its European discoverer, a navigator by the name of Arendt Corssen, in the service of the Dutch West India Company. In other words, literally, it means "Hidden River River". SEPTA offers a variety of options, and so this depends on where you're coming from. If you are already in downtown Philadelphia, or you are coming from one of the nearby neighborhoods, you want to get to around 15th and Market or so. You can take either the Broad Street Subway / Orange Line and disembark at its City Hall stop, and follow the directions below. From the historic area, you can take the Blue Line / Market-Frankford Line / "el" - which are all names for the same transit line - to its 15th Street stop, which leaves you at 15th and Market Streets, and just follow the directions below. However, if you are coming from the suburbs, or one of the more distant neighborhoods, the best way to get there, is to use SEPTA Regional Rail to travel to Suburban Station - at 16th Street and John F. Kennedy Boulevard. From there, you can walk to 17th and Arch Streets, and look for signs for SEPTA Bus Route 48. Make sure to ask the driver if you are going in the proper direction, northbound (ask if the bus is going toward Kelly Drive, or away from it). You'll be on the bus for about 12 minutes. From there, watch for the intersection of 26th and Aspen Streets. Disembark there, and you can walk to Boathouse Row. Turn left on 26th Street, walking southbound, make a slight left turn onto Pennsylvania Avenue, and then a right onto Fairmount Avenue. Fairmount Avenue will become Kelly Drive, and you'll see the river. Just keep going till you reach Boathouse Row. However, we would recommend walking to Boathouse Row, from the Philadelphia Museum of Art - located at 26th and the Benjamin Franklin Parkway - which offers a spectacular walk, especially when the weather is pleasant. The bus service doesn't go directly to Boathouse Row, and the Phlash doesn't stop there, either. However, you can get to the Museum of Art easily, via either SEPTA or the Phlash trolley - if you happen to be in town between May 1 and Halloween, the six months during which the Phlash operates. And since it's primarily a recreational area, you're better off just going to the Museum of Art, and enjoying the scenic walk along the Schuylkill River. 1801 - Although this cannot be verified, this is the date of a race purportedly made by the University of Pennsylvania, against a New York City boat club. 1817 - A large dam is constructed on the Schuylkill River, as part of the elaborate, innovative Fairmount Waterworks municipal project. Waterwheels replace steam engines, and the city's water supply and cleanliness improves. A beneficial side effect is that as a result of the dam, the Schuylkill River becomes much calmer - and suitable for recreational sports, such as rowing. 1820s - Rowing, although practiced since the time of ancient empires, begins as a recreational sport in Britain, when rowing clubs emerge at Oxford and Cambridge. 1835 - The first recorded regatta takes place on the Schuylkill, between the Blue Devils and the Imps. 1840s - Inspired by the British example, Harvard and Yale form rowing clubs as well. 1850s - The novelist William Taylor Adams - writing under the pseudonym "Oliver Optic" - contributes to the popularity of rowing as a sport in America. 1854 - The City of Philadelphia is merged with surrounding Philadelphia County, in order to improve the quality of civic life. One effect is that the Pennsylvania legislature grants the city the right to create Fairmount Park and other recreational areas. 1858 - The formation of the Schuylkill Navy is officially announced, with nine member clubs and about 300 rowers. 1860s - Another ripple effect of the Consolidation, is that the initial, temporary boathouses - which were built for function, not aesthetics - are eradicated, as the new Fairmount Park Commission has the power to review "all houses and buildings now built it or to be built in any part of the Park grounds, by of for boat or skating clubs..."
As a result, significant boathouses start to emerge, after the Commission began its review of any structures related to recreation. Eventually, over the decades, a variety of styles - Italianate, Colonial Revival, Victorian Gothic, among others - are seen along Boathouse Row. 1872 - The Schuylkill Navy officially declares a distinction between amateur and professional rowers, permitting only amateurs to compete. This decision paves the way for the distinction between amateurism and professionalism, in all other sports. 1900 - A crew representing Vesper Boat Club wins an Olympic gold medal. 1920 - John B. Kelly, Sr. - the father of the famous actress Grace Kelly - becomes the first American to win an Olympic gold medal in singles competition. 1920-1932 - Boathouse Row club members form the majority of American rowing Olympians. 1953 - The Dad Vail Regatta shifts to Philadelphia, where it has remained. 1983 - The Schuylkill Navy celebrates its 125th anniversary; it had grown to ten clubs and about 1300 rowers. 1987 - Boathouse Row - defined as 1-15 East River Street - is officially named to the list of the National Register of Historic Places. Ironically, this takes place in the same year of the Bicentennial of the U.S. Constitution, promulgated in 1787 in Philadelphia. 2008 - The Schuylkill Navy celebrates its 150th Anniversary. There are currently ten clubs in its charter, and fifteen boathouses comprising Boathouse Row. Ironically, the first Boathouse you'll encounter on your walk is from the 21st century - a sharp contrast to the 19th century, Victorian ones which comprise most of the rest of Boathouse Row. In 1998, the Fairmount Park Commission approved a plan for Gillin Boat House at its current location. The lot is over 20,000 square feet, and the Boat House per se is over 15,000 feet. It was named after Robert Gillin, Jr., who was born in 1962. Gillin rowed for Haverford School, Georgetown University, and at the Henley Royal Ragatta, before dying tragically in 1992, at the age of 30. The Boat House was named after him to commemorate his life. Lloyd Hall, like Gillin Boat House, is a modern structure. It holds the distinction of being the only Boathouse open to the public for recreation. The Fairmount Park Commission itself constructed Lloyd Hall, which was completed in 1998. Its goal was to provide a public recreation center on Boathouse Row - and it succeeded. Among its amenities, it has a concession stand, restrooms open from 7 AM to 9 PM (both inside and outside), and plenty of recreational opportunities. They range from formally organized sports sponsored by the Fairmount Sports Association, to pickup basketball and volleyball to any number of classes on different subjects. The second Boathouse building was originally constructed in 1860 by the Pacific Barge Club, which had formed the previous year. It was divided into two halves. Several years later, the Quaker City Barge Club, which had formed in 1858, bought the northern half of the building - and they put another addition on its half. In 1877, the Fairmount Rowing Association was created. Four years later, in 1881, it bought the other, southern half of #2 Boathouse from the Pacific Barge Club. In 1885, Quaker City constructed its own single-story building. In 1904, Fairmount demolished its half of #2 Boathouse, and replaced it with a Flemish-bonded brick building, in the Georgian Revival style. It was designed by the prominent architect Walter Smedley. In 1916, Fairmount was - at last - accepted into the Schuylkill Navy, after decades of unsuccessful efforts to do so. In the meantime, Quaker City began to fade. After 1926, they no longer competed in Schuylkill Navy regattas, and by 1932, they officially declared themselves "inactive". In 1945, Fairmount bought Quaker City outright, obtaining its building and equipment, and connected its half of #2 Boathouse Row with Quaker City's building. It also meant that the address #3 Boathouse row no longer exists. It also hosts the Quaker City Masters Regatta. La Salle College High School and Episcopal Academy's programs currently use this Boathouse. Source: Lee Silverberg - A Very Brief History of Fairmount Rowing Association, 2008. In 1867, Crescent was formed by the merger of the Pickwick Barge Club and the Iona Barge Club. The following year, Crescent officially joined the Schuylkill Navy as one of the ten charter members. Crescent began construction on its own Boathouse; the first floor was finished in 1871. Two decades later, the distinguished architect Charles Balderton finished the second floor, in 1891. Crescent remained robust until after World War II, when declining membership meant that #5 Boathouse Row was turned over to La Salle College's rowing program during the 1950s. However, it eventually reoccupied the Boathouse, where it remains to this day. This Boathouse is made of brick, with arches on the second floor. Perhaps its most distinctive feature is its door facing Kelly Drive, which is painted blue and red. Although originally founded for single men, membership has not been limited to bachelors since the 19th century - in fact, the restriction lasted only a few years, but the name stuck. Ironically, today a majority of its 150 or so members are female. In 1853, it was formed largely by members of the Phoenix Engine Company, a volunteer fire fighting organization. Bachelors originally had a nondescript wooden structure, which it built at the cost of $67.85. However, in keeping with the principle of improvement of the Fairmount Park Commission, it built an impressive structure in 1893, which remains today, as #6 Boathouse Row. In the 1920s and 1930s, Bachelors members won 10 medals at the Olympics. Over time, however, membership declined, and Bachelors at its nadir had only 10 members, during the 1980s. However, it successfully revived itself, and is now as involved as ever in the rowing scene. University Barge Club can boast of being the second-oldest rowing club in Philadelphia, still in active operation. Ten students at the University of Pennsylvania founded the club in 1854, hence the name. Early on, it was limited to Penn students, and then Penn alumni, but the restriction vanished, ultimately. In 1858, University Barge Club became a charter member of the Schuylkill Navy. After the Civil War ended in 1865, rowing's popularity burgeoned, and University Barge Club did as well. In 1871, in collaboration with the Philadelphia Barge Club, it constructed #7 Boathouse Row. Each club had half of the building, and became friendly rivals, frequently competing with each other. In the early 20th century, the Great Depression had an impact on rowing, and Philadelphia Barge Club disbanded in 1932, merging with University Barge Club. In 1954, the Schuylkill Navy officially acknowledged the Centennial of University Barge Club. In 1968, it initially organized what would evolve into the Head of the Schuylkill Regatta, one of the most popular rowing events. In 1990, it voted to include women as full members. Nine years later, on the dawn of the 21st century in 1999, its Lea Balcony was added to the facade, restoring it to its original appearance. And in 2004, it celebrated its 150th anniversary. On February 22, 1860 - the year of the election of Abraham Lincoln as President - the Malta Barge Club was formed. Its membership was comprised of seven members of the Sons of Malta, which had a lodge called Minnehaha. Malta originally had a clubhouse on the Delaware River, not the Schuylkill, on Smith's Island, near Chestnut Street. It shifted to the Schuylkill, joining the other clubs, in 1863, near the site of the Spring Garden Street Dam, near Fairmount Avenue. Two years later, in 1865 - as the Civil War was ending - Malta bought the clubhouse of the Excelsior Club, which had been founded in 1859 - but had not survived the war. In February, negotiations began, and in March, the deal was done. Malta has remained on that site, at #9 Boathouse Row, to this day. In 1883, a mutual expansion plan was worked out with its next-door neighbor, the Vesper Boat Club, which is discussed below. In 2010, Malta celebrated its 150th anniversary. Vesper began its existence on February 22, 1865, and was known as the Washington Barge Club. On New Year's Day, 1870, it changed its name to the Vesper Boat Club, which it has remained to this day. In 1865, its Boathouse was constructed along with that of Malta, as noted above, and its cornerstone reflects that date. It added a second boat bay in 1898 and another addition in the 1960s. Its architecture is Victorian Gothic, and was designed by architect G.H. Hewitt - and club members actually constructed the Boathouse. At the dawn of the 20th century, at the first Olympic rowing regatta, held in Paris in 1900, a Vesper crew of eight captured a gold medal. It repeated the feat at the next Olympics, in St. Louis, Missouri, in 1904. But Vesper is best known as the Boathouse most closely associated with the world-famous Kelly family, the source of the name Kelly Drive. John B. Kelly, Sr., the owner of a brickworking business, won Olympic medals in 1920 and 1924, and eventually became a prominent figure in Philadelphia politics. Kelly, Sr., was notoriously barred from participating in the most prestigious regatta in the world, the Royal Henley Regatta in Britain, because he was a bricklayer. Two of his children went on to even greater prominence. His daughter was the actress Grace Kelly, who later became Princess Grace of Monaco after marrying Prince Rainier, before her untimely death. His son, John Kelly, Jr., was permitted to compete at Henley, and won events there in 1947 and 1949 - and also managed to win eight national titles - and was the head of the U.S. Olympic Committee at his death in 1985. During the 1990s, Vesper renovated its Boathouse substantially, and it was complete by 2001. College Boat Club has a red and white exterior, and was constructed in 1874, in the Victorian Gothic style - originally, the only style permitted by the Fairmount Park Commission. September 30, 1872 - The College Boat Club is formally organized, largely by sophomores at the University of Pennsylvania, the class of 1875 - although members of other classes also participated. However, its original name is the College Barge Club, which is its name on its founding documents. This is the second boat club formed by Penn students, as the University Barge Club was formed two decades earlier. However, the College Barge Club can take credit for launching Penn into the nascent world of intercollegiate rowing competition. In 1871, four New England colleges - Harvard, Brown, Amherst, and Bowdoin - had formed the first intercollegiate rowing association, the Rowing Association of American Colleges - and Penn wanted to join in the fun. 1874 - The College Barge Club has been sufficiently successful at fund-raising, to construct its own boathouse on Boathouse Row. April 4, 1875 - College Boat Club officially joins the Schuylkill Navy. October 1875 - College Boat Club is incorporated. Additions were made to the College Boat Club House in 1969 and 1980. To this day, membership in the College Boat Club is limited to Penn students and alumni. The Penn AC Boathouse is gray stone, with light blue trim, and flies the club's flag, which is a navy field with a yellow vertical stripe on the left side. In 1871, what would become Penn AC began its existence as the West Philadelphia Rowing Club, which was based on the opposite side of the Schuylkill, and was incorporated in 1873. As for the Penn Athletic Club, ironically, did not start as a rowing club - it was a downtown men's social club, which wished to involve itself in rowing. It successfully persuaded West Philadelphia RC to change its name to Penn AC, which it has remained to this day. Its original boathouse cost $290, and was built on the proper side of the Schuylkill River (although not on its current location) measuring 60 by 16 feet in size. In 1873, West Philadelphia merged with Woodland Boat Club, acquiring all of its property for $200. A lavish boat house was constructed on Woodland's site, costing $12,000. The Victorian Gothic boathouse, with one and a half stories, opened its doors in 1878 (it was designed by the same architect that created Reading Terminal). Alterations were made in 1883, 1968, and 1981. In 1882, it won its first recorded victory, in the Schuylkill Navy Regatta. Despite its name, it has no restrictions of any kind on its membership - anyone may join. The Undine Barge Club boat house is in the Victorian Gothic style approved by the Fairmount Park Commission. On its flagpole are three flags arranged vertically - the American Flag, its own blue flag with a yellow chevron, and a white flag with the black and gold Undine coat of arms. In Roman mythology, Voluptas was the beautiful daughter of the god Cupid and the goddess Psyche. In Greek mythology, Voluptas's name was Hedone, from which we derive the words "hedonism" and "hedonic". It is made of stone, with a cool turret and a gray roof, with green trim, as well a second story balcony, and a red-brick chimney. 1856 - The Undine Barge Club is founded. Its unusual name comes from an unusual source. 45 years earlier, there was a book of German folklore published by the name of Undine. Undine was a German water goddess, and the novel was so popular that it inspired the name, four and a half decades later. 1875 - Undine hires the distinguished architecture team of Frank Furness and George W. Hewitt to create Castle Ringstetten, as an "up-river" clubhouse. It remains in use today for Undine members. 1882 - Seven years later, Undine contracts with Furness and his new business partner, Allen Evans, for a new boathouse on the current Boathouse Row. April 3, 1882 - Construction begins on the Boathouse, which will eventually cost $14,000. April 30, 1882 - The cornerstone of the Boathouse is lain. October 29, 1882 - Undine officially rows for the first time out of its new Boathouse. Spring 1883 - The Boathouse is completed. Summer 1883 - The Boathouse is officially opened. Upon its completion, the new Undine Boathouse is praised as "a celebration in stone and wood of athletic endeavor and fellowship". Furness and Evans design a two-and-a-half story boathouse, with the Gothic tower accessible by a staircase, permitting visitors to reach the upstairs lounge. Its balcony, covered with a green-and-white striped awning, provides a beautiful view of the Schuylkill. The ground floor is essentially for storage, with two "barn" style door opening up to the ramps to the Schuylkill River. 1996 - Undine Barge Club commissions an architectural firm, to create a substantial restoration process of the Boat House. 1997 - Final funding becomes available, for the exterior restoration work to begin. 1999 - The completion of the renovation is officially commemorated. #14 Boathouse Row, ironically, is far older than its current owner, the Philadelphia Girls Rowing Club. Made of gray stone and light blue and white trim, it is an example of the Italianate style (as opposed to the Victorian Gothic style of many other Boathouses). It was commissioned by the Philadelphia Skating and Humane Society. During the late 18th and early 19th centuries, the land originally belonged to Robert Morris, the owner of the Lemon Hill estate, but after his financial ruin, it was purchased by a merchant named Henry Pratt, and it became known as Pratt's Point. The Skating and Humane Society requested the grant of land from the city as early as 1855, and the Boathouse was completed in 1861. It is likely the oldest structure that still survives on Boathouse Row. The reason for the inclusion of the word "Humane" in the club's title, reflects the fact that it also served as an ice patrol to protect ice skaters on the Schuylkill. On January 28, 1860, the Philadelphia City Council passed an ordinance, providing permission for "the Skaters' Club House on which to erect a building for a safe and convenient deposit of their apparatus used for rescuing persons from a watery grave." On March 22, 1860 - several weeks later - the Skating Club had picked out the site, and five days later, City Council approved the architectural design. It would open the following year. The Skating and Humane Society operated it for several decades. Eventually, the Boathouse was rented by both University and Undine, each of which we've discussed earlier. On May 4, 1938 - nearly seven decades after the completion of the Boathouse - the Philadelphia Girls Rowing Club was formed by 17 women. Membership remains open, only to females, to this day. When driving into Philadelphia via Kelly Drive, this distinctive Boathouse with a lighthouse is the first one that you see - and the Lighthouse actually predates the Boathouse. Turtle Rock was the name given to a rock formation which resembled a turtle shell, above the Boathouses. In 1887, the Fairmount Park Commission authorized construction of a Lighthouse, for public and navigational safety, just at the end of #14 Boathouse Row. It became known as Turtle Rock Lighthouse. Two years later, in 1889, the Bicycle, Barge, and Canoe Club formed, and occupied #14 Boathouse Row, described above. Three years later, in 1902, it requested permission to build its own Boathouse, which would be #15 Boathouse Row. It was granted, and so the Sedgley Clubhouse was built around the existing Turtle Rock Lighthouse. It was designed with a combination of Colonial and Georgian styles, with red brick. The Sedgley club had its origins as a group of female Philadelphians who enjoyed canoeing on the Schuylkill, but eventually evolved into a social club, and it is no longer an active Boathouse. If you'd like to leave Boathouse Row and return to the Home Page of Enjoying Philadelphia, please click here.